Since 1996, Life Extension has warned about the lethal dangers of excess fibrinogen, an inflammatory protein produced by the liver. Studies appearing in the world's most prestigious medical journals indicate that excess fibrinogen is a strong predictive mortality factor. According to one study, "fibrinogen levels were the only independent predictor of mortality." Life Extension has reviewed dozens of studies and determined that optimal fibrinogen levels should range between 215 and 300 milligrams per deciliter (mg/dL) of blood. If your fibrinogen levels are significantly above 300 mg/dL, you may want to consider supplementing with Fibrinogen Resist formula. Fibrinogen Resist provides targeted nutritional support for those seeking to maintain blood fibrinogen levels in healthy ranges. This new formula offers a unique combination of enzymes and antioxidants that support cardiovascular health. 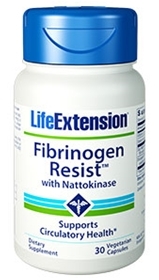 Each capsule of Fibrinogen Resist provides NSK-SD nattokinase, the most bioactive form of this enzyme available. Nattokinase maintains healthy coagulation, dissolves fibrin (a clotting factor), enhances the body's production of clot-dissolving agents, and supports healthy levels of fibrinogen. Also included is a pine bark extract called Enzogenol that has demonstrated antioxidant and fibrinogen-managing effects. In a study of smokers--who typically have elevated fibrinogen levels--the combination of Enzogenol and vitamin C significantly helped normalize fibrinogen levels. NSK-SD is a trademark of Japan Bio-Science Laboratories. Enzogenol is a registered trademark of Enzo Nutraceuticals, Ltd. This formula has a unique combination of enzymes and antioxidants to support cardiovascular health.